The production of a marketing plan is at the core of any new startup business, it is likely to be a standalone sub-plan within your overall business plan. How you are going to promote and market your products, or services, will determine the volume of sales that you achieve, and most likely the financial success of your business. You don’t have to do the marketing planning and delivery yourself. You could use a professional marketing agency to do all the work for you. 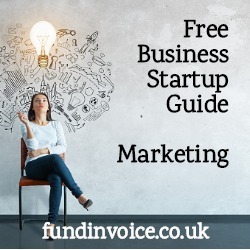 This rest of this section of our business startup guide, assumes that you will be conducting the activity yourself, and so gives some pointers about how to plan the marketing for your new start up company, together with a few tips and marketing ideas that you might not have thought about. The first step is to “define your market”, if you don’t know who you are trying to sell to, you cannot target your marketing communications to those target customers efficiently. The more accurately you can define the segment of the market that you are targeting, the more exact you can be with your marketing (this is called market segmentation). There is a good example, based on our own experience, in our article "Growing The Success Of Your Business". Once you have identified the segment, or segments that you intend to target, the next task is to size the market. The purpose of this is to ensure that there will be sufficient target customers for your business - and to confirm the market share that you will need to acquire in order to support your financial objectives. For example, if you decide to target say "invoice finance companies", there are only just under 100 in the UK. Therefore, if your business plan requires at least 200 customers, the market sizing exercise has identified a major hole in your business plan. You then need to either rethink your offering, or target further segments. If your plan requires you to achieve a significant market share, you need to think carefully about why all those customers would use your business, particularly if there are already other competitor offerings servicing the sector. This links to the issue of unique selling points raise in the business planning module of this guide. Define exactly what you are going to be delivering to your customers. The value proposition is not just your product, it is everything that you deliver to the customer surrounding your product or service. For instance, how you support them, speed of response etc. what makes your offering of value to your customers? The next step is to look at who is already offering the same or similar products and services, and how their product propositions compare with your own. Who are your main competitors, and what are their strengths and weaknesses? From these you can identify how to sell against each of them, and where your product proposition is superior. This will inform your marketing and aid the selling process. Set out how you are going to approach your marketing, your strategy and activities. Many business plans will include a detailed plan of the marketing activities on a timeline. Costings also need to be obtained and set within a marketing budget, that will form part of the financials of your business plan. You should also define the markers that you will use to track the success of your campaigns. For example, numbers of leads or enquiries generated (this gives rise to the issue of identifying and tracking the source of enquiries in order to measure performance), or market awareness levels that you achieve. One key point to mention is the need for a very clear "call to action" in the case of any marketing campaign. This means having a very clear message to the customer as to what they should do next e.g. phone this number, enter these details and press apply now etc. Without this, you are relying on your customers to work out the best way to contact you themselves, and this adds an additional, and unnecessary, obstacle to the sales process. These are a few marketing methods (its not a comprehensive list of marketing methods) that you could consider the merits of using. With the advent of GDPR (new regulations about data protection) it is wise to understand your obligations and the restrictions that these place on some forms of marketing. Use of advertising is likely to form part of most marketing plans. In our own case, we buck the trend and really don't use any paid advertising whatsoever, however this approach is rare. There are some handy tips about advertising in this article: "It Pays To Advertise". This activity can encompass a broad range of advertising media. From broad general awareness advertising, to highly targeted adverts in niche publications. It could include both adverts in printed media (magazines, billboards or newspapers) and online e.g. Google Ads. Newsletters are a great way to stay in touch with existing and prospective customers. Our article "Marketing Ideas To Grow Your Business" explains newsletters and social media in more depth. A regular newsletter lets you send material to your customers, this can be electronic via email, to minimise costs and enable detailed tracking of activity. Social media refers to the numerous web sites such as Twitter, Facebook, Instagram, Google+, Pinterest and LinkedIn that allow you to share your content publically, and to build and interact with, a following of other users that are interested in your content. Whilst many will argue that direct mail has had its day due to overload, there are still many companies that successfully use this avenue. An alternative is email marketing but again, the rise of huge volumes of spam emails has turned many people off of this medium. However, building a following of subscribers that are interested in your services, and emailing them regularly, can pay huge dividends. Again, calling prospective customers has reached a point where many end users opt out of receiving such calls, and telemarketers often get a very abrupt response when they cold call. However, once again there are businesses that still successfully use this method. There are plenty of networking groups that new entrepreneurs can join, in order to build their business contacts. Also, if you have existing contacts from your previous roles, don't be afraid to leverage them as part of your marketing approach. Building a network of third parties that will introduce business to you is a great way of promoting your business. This is very common in our sector where many providers rely on third parties such as brokers, accountants and business advisers to introduce customers to them. Your business website is the new equivalent of a company brochure and shop front, rolled into one. You can promote your site via your own hard work e.g. writing content, promoting it and seeking links from other reputable sites. Or you may choose to pay to promote your content. The subject area is vast and specialist help is likely to be needed to create a search engine friendly website that will rank well with the search engines such as Google. The production of "viral" content is the holy grail of many internet marketers. The concept is to create something that will be spread and shared from user to user, via channels such as social media, carrying details of your business with it e.g. a funny video or image. One of the best ways of promoting a business is by recommendations from existing customers. You may be able to mine your existing customers to try and encourage their contacts and customers to use your services. You might choose to incentivise your customers to introduce new customers to you with discounts or rewards. PR refers to promotion of your business via press releases and hence free inclusion in other publications, without paying for an advert. This can be useful if you have interesting breaking news to share, as there are plenty of publications that are looking for interesting stories to write about. They then promote your business as part of their publication. There are many niche exhibitions across the UK. You can identify those that are likely to attract your target customers and you can exhibit at those exhibitions. This can be quite a costly method for a new company to use. These are the best methods, clever (often inexpensive) ways that you come up with to promote your product. For example you might offer a prize competition in order to attract interest or you might design some other catchy approach to creating contact with customers e.g. offering a small part of your service for free, in order to have a chance at quoting for the supply of the full service. We have also put together a list of growth strategies for businesses, and a free guide to business growth, that you might want to consider.